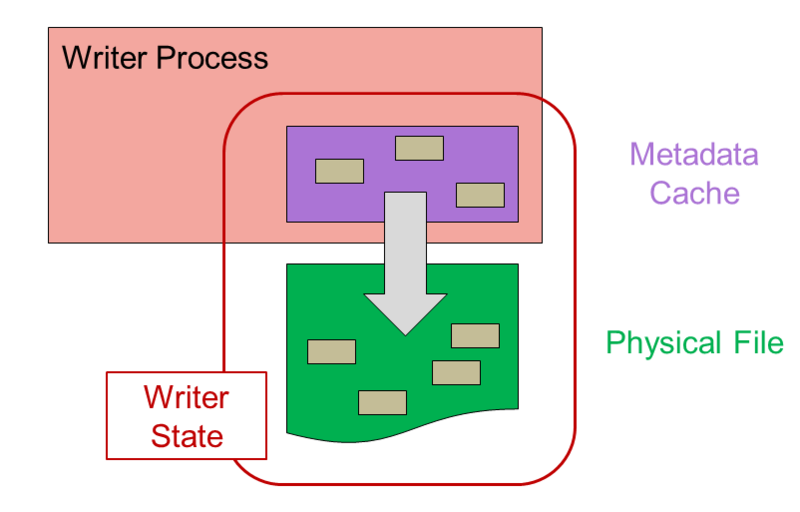 The Single-Writer / Multiple-Reader (SWMR) feature enables multiple processes to read an HDF5 file while it is being written to (by a single process) without using locks or requiring communication between processes. 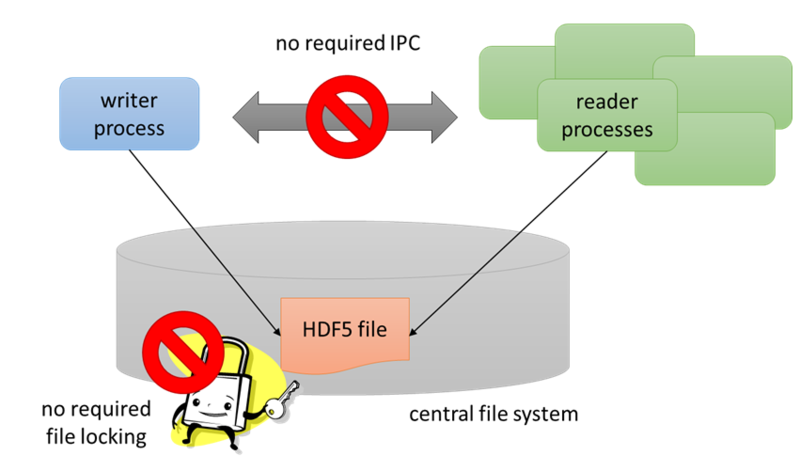 All communication between processes must be performed via the HDF5 file. The HDF5 file under SWMR access must reside on a system that complies with POSIX write() semantics. The basic engineering challenge for this to work was to ensure that the readers of an HDF5 file always see a coherent (though possibly not up to date) HDF5 file. The SWMR solution implements dependencies on when the metadata can be flushed to the file. This ensures that metadata cache flush operations occur in the proper order, so that there will never be internal file pointers in the physical file that point to invalid (unflushed) file addresses. 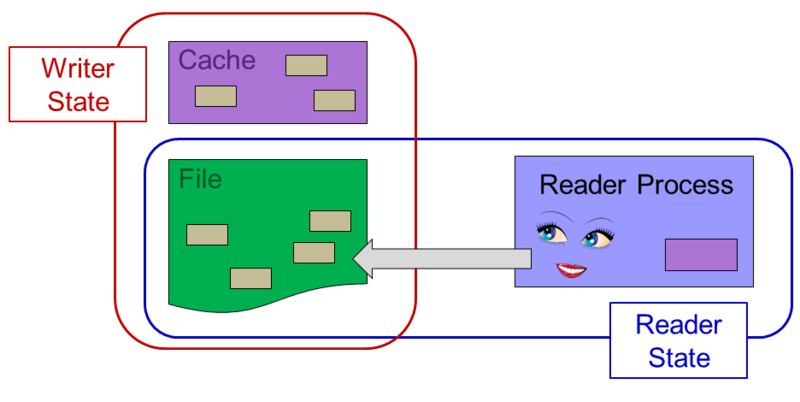 A beneficial side effect of using SWMR access is better fault tolerance. It is more difficult to corrupt a file when using SWMR. h5watch — Outputs new records appended to a dataset as the dataset grows. h5format_convert — Converts the layout format version and chunked indexing types of datasets created with a 1.10.x version of the library so that applications built with a 1.8.x version of the library can access these datasets. Please be aware that the SWMR feature requires that an HDF5 file be created with the latest file format. See H5P_SET_LIBVER_BOUNDS for more information. To use SWMR follow the the general programming model for creating and accessing HDF5 files and objects along with the steps described below. The SWMR writer either opens an existing file and objects or creates them as follows. Call H5Fopen using the H5F_ACC_SWMR_WRITE flag. Call H5Fcreate using the latest file format. Create groups, datasets and attributes, and then close the attributes. Call H5F_START_SWMR_WRITE to start SWMR access to the file. Call H5Fopen using the H5F_ACC_SWMR_READ flag. Poll, checking the size of the dataset to see if there is new data available for reading. Read new data, if any. Appending data along any unlimited dimension. The writer cannot add new objects to the file. The writer cannot delete objects in the file. The writer cannot modify or append data with variable length, string or region reference datatypes. File space recycling is not allowed. As a result the size of a file modified by a SWMR writer may be larger than a file modified by a non-SWMR writer. The h5watch tool allows a user to monitor the growth of a dataset. The h5clear tool clears the status flags in the superblock of an HDF5 file. The rest of the HDF5 tools will exit gracefully but not work with SWMR otherwise. Download the HDF5-1.10 source code to a local directory on a filesystem (that complies with POSIX write() semantics). Build the software. No special configuration options are needed to use SWMR. Invoke two command terminal windows. In one window go into the bin/ directory of the built binaries. In the other window go into the test/ directory of the HDF5-1.10 source code that was just built. In the window in the test/ directory compile and run use_append_chunk.c. The example writes a three dimensional dataset by planes (with chunks of size 1 x 256 x 256). In the other window (in the bin/ directory) run h5watch on the file created by use_append_chunk.c (use_append_chunk.h5). It should be run while use_append_chunk is executing and you will see valid data displayed with h5watch. Interrupt use_append_chunk while it is running, and stop h5watch. Use h5clear to clear the status flags in the superbock of the HDF5 file (use_append_chunk.h5). View the file with h5dump. You will see that it is a valid file even though the application did not close properly. It will contain data up to the point that it was interrupted.